In one of his characteristically terse email replies, Apple chief executive Steve Jobs has reportedly told one Mac user that changes in video camera technology have reduced the need for FireWire on his company's 13-inch MacBooks. The one-line response to a fan complaining over the lack of FireWire on the new entry level aluminum MacBooks is blunt but also points out that technology has changed since the company began including FireWire with Macs in 1999. "Actually, all of the new HD camcorders of the past few years use USB 2," Jobs supposedly wrote in an email, a copy of which was posted to the popular Flickr image sharing website. Jobs is likely not pleased about the current state of FireWire himself. Apple invented the standard in the late 80s as a hot pluggable replacement for SCSI, with a special emphasis on supporting media streaming with isochronous, real-time data transfers. The company then released the specification through a standards body to become IEEE 1394, where others including DEC, Texas Instruments, and Sony contributed to its development as well. Upon returning to the beleaguered Apple in 1997, Jobs hoped to earn Apple some licensing royalties from the technology, which was quickly becoming an emerging standard not just to replace SCSI but also in video and music applications. Jobs' plan resulted in Intel offering to upgrade its USB standard to speeds approaching FireWire at a lower cost. The 'master to slave' USB 2.0 protocol was cheaper to implement than the 'smart peers' design of FireWire because USB required less intelligence in the controllers. Somewhat ironically, Apple's 1998 iMac originated the push behind USB that allowed it to gain rapid adoption among consumers. USB 2.0 built upon that ubiquity to push into the peripheral territory that had been wholly owned by FireWire. In 2001, Apple's iPod began to popularize FireWire as an interface that was much faster for syncing the then relatively large MP3 files compared to existing players that used USB 1.0. However, by 2003, Apple started adding USB 2.0 support to target PC buyers, where FireWire ports were rare. By the end of 2005, Apple had removed FireWire sync from the iPod line as a cost savings measure. While USB 2.0 ate into the casual peripheral market for consumer hard drives and web cams, FireWire retracted to support applications where USB 2.0 wasn't suitable. It retains clear advantages over USB 2.0 among higher performance hard drives, but in that market, FireWire is now competing against eSATA, which developed from ATA cabling. Historically, FireWire has been the way to import video from digital cameras, but as Jobs' purported email announced that is no longer always the case. A glance at the product pages for Canon, Hitachi, JVC, Samsung and Sony as well as Amazon's top camcorder list indicates that virtually all new compact consumer HD cameras now use USB 2.0 to transferring footage directly to a computer instead of the FireWire. Some camcorders also offer the option of burning directly to DVD and a few can transfer video over a USB-to-FireWire bridge cable. 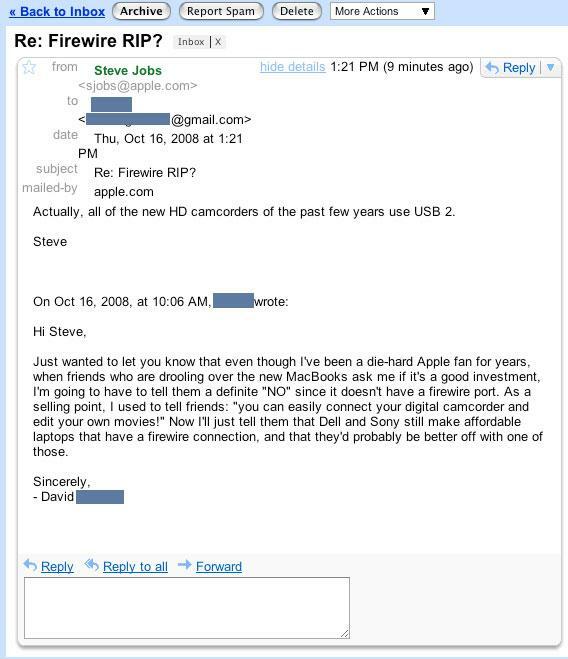 A purported email reply from Apple chief executive Steve Jobs. That reality is little comfort to those who fall outside of Apple's market for the new entry-level portables, many of whom are vocal in their opinions in Apple's support discussions as well as AppleInsider's own forums. Support for older cameras, many of which (particularly DV tape models) depend on FireWire, is ruled out by Apple's aluminum MacBook update; so too are prosumer cameras such as Sony's HDR-FX1000, which needs the faster throughput of FireWire (called i.LINK by Sony) to deliver raw content if a card reader isn't used. To serious amateurs or professionals who prefer a smaller system, the loss of FireWire on the new entry level MacBooks is a vexing problem. "I am a video producer and use my MacBook on site to ingest footage taken from FireWire cameras, even occasionally hooking the camera right up to the MacBook," says one Mac user with the previous generation system. "Well, it looks like there isn't a FireWire port on it anymore... how the heck am I supposed to do that? I am sure I am not the only one with this concern." Professional musicians also use FireWire in recording equipment. Others have noted that the lack of FireWire additionally rules out Target Disk Mode for managing files or cloning systems, as USB 2.0's architecture lacks the capacity to support that feature. Apple's Migration Assistant software now alternatively supports importing files from another machine over Ethernet, from USB drives, or Time Machine backups, however. Even so, many argue that Apple's move appears built to upsell any serious user to the MacBook Pro, which starts at $800 more than the entry level new MacBook, despite the fact that Apple continues to sell the previous-generation white MacBook, with FireWire intact, for $300 less than the new aluminum MacBooks. There's no doubt that the removal of FireWire from the MacBook was as difficult of a decision for Apple as it is a mourned loss for many Mac users. With FireWire increasingly receding into the professional space, Apple had to weigh several variables, including the cost of incorporating another port to its entry level laptop that many of its new users wouldn't even recognize. After all, half of the buyers Apple is selling to in its retail stores are new to the Mac. Being able to offer them a lower price will likely help more than trying to sell them on the concept of Target Disk mode, which is entirely foreign to PC users. The future of FireWire is still up in the air. Apple retained the FW800 version (running at 800Mbps, twice the speed of the original specification) on the new MacBook Pro, providing substantially faster throughput than USB 2.0. On the MacBook, FW400 doesn't offer most users enough of an advantage over USB 2.0 to warrant taking up the limited space on the port panel and on the logic board. "Many of us don't have great confidence that FireWire is here to stay on MacBook Pro, Mac Pro, or iMac, either," one forum user wrote. With the advancement of USB 2.0 on the low end, erosion from eSATA among hard drives, and a migration away from FireWire even in its home field advantage among digital video users, Apple is probably wondering the same thing. The new HD camcorders start around $500. Thanks for the fast response! In answer to your statement, though, I decided to look at the selection of camcorders on BestBuy.com since I believe they represent a pretty average staple of what consumer electronics people are buying. Although you are correct that (almost) all of the new HD camcorders use USB 2.0, there are still many, many standard definition camcorders (read: affordable for average Joes) that require firewire. Does this mean to say that Apple no longer supports average Joes from making home movies on their computers? In other words, if I have a $300 firewire camcorder and a new MacBook, shouldn't I be able to edit videos of my kid's birthday just as easily as someone who has a MacBook Pro and a $1200 HD camcorder?